The Ice Sheet at Ogden photo challenge- Take a picture of the ice rink with the American Flag in the background. Rice-Eccles Stadium photo challenge- Take a picture of the Olympic Cauldron at the stadium. EnergySolutions Arena photo challenge- Take a photo of the Olympic memorial monument that stands on the plaza. Olympic Legacy Fountain at The Gateway open response challenge- What song was playing when you saw the fountain going off. The Gallivan Center photo challenge- Take a photo of the Olympic memorial monument that stands on Main Street. Salt Palace Convention Center photo challenge- Take a picture with our official "Ranger" welcoming you to Salt Lake in the Visitor Information Center. Utah Olympic Park photo challenge- Take a picture of the bobsled track. 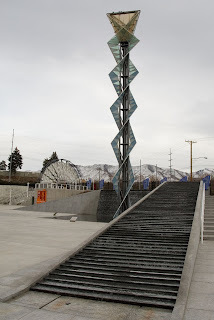 Utah Olympic Oval photo challenge- Take a photo of the Olympic memorial monument that stands outside the Oval. Maverik Center specific text challenge- What medal did the United States win in Hockey at the 2002 Olympics? Park City Mountain Resort specific text challenge- What band played a concert at the base of the resort during the Olympics? Read more about the Ten Year Olympic Anniversary! One of the finest attractions in Utah. I have seen the Winter Olympic attractions two years ago. I hope to catch it again.